Inatur Herbals is a fantastic natural and organic brand. Their beauty, skin and hair care products that are Vegan, Natural, Organic, Safe, Tested Dermatologically, Sulfate free, Paraben free. I recently tried their body lotion which was quite good. 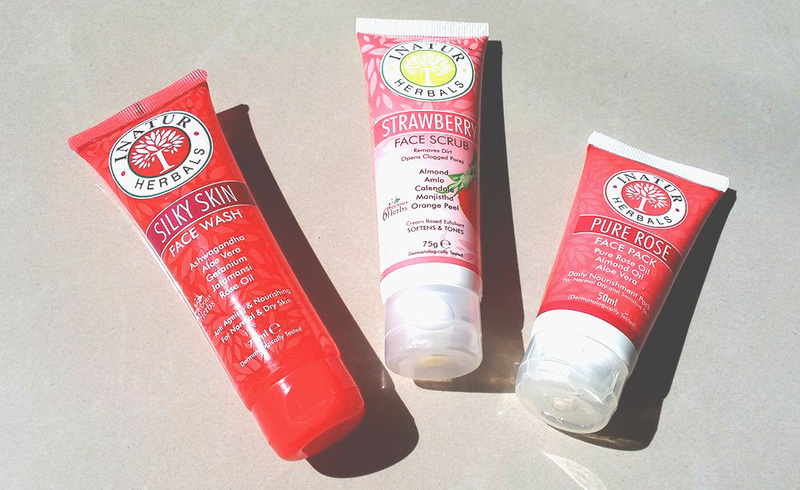 In today's post, I'm featuring the 3 skincare products that for sure you love to try them out. This face wash is specially designed for normal and dry skin. It has anti-aging and nourishing properties that nourish and rejuvenates the skin and also reduces fine lines. Silky Skin Face Wash enriched with some amazing natural ingredients like ashwagandha, aloe-vera, geranium, honey extract, jatamansi and rose oil. I have a dry skin and it's gentle formula helping to keep skin clear. It has a very subtle/delicate rose scent which quite refreshing. The thick gel-like consistency with pink granules that melts easily on your skin. It's a soap-free face wash so it does create hugely foam and doesn't feel too 'soapy'. But it very effectively cleanses and removes all impurities from your skin.I like to use this in the evening but you can also use it in your morning skincare routine as well. It's very gentle and has such a great texture. It's a light creamy face scrub, has tiny bits of exfoliating granules. You get all the benefits of this scrub which makes your skin very soft, smooth and clean. The scrub smells like strawberry, bit strong for me. Suitable for all skin types, and it is filled with the goodness of Strawberry that removes the accumulation of dead skin and helps rejuvenate the skin by locking moisture within. Almond, helps to eliminate toxins and gives mild exfoliation, Calendula, helps to soothe and tone the skin, Amla, helps in reviving the skin texture, flushes out toxins, avoids occurrence of acne & pimples and brings glow to the skin, Orange Peel, reduces oiliness, helps reduce suntan, finally Manjishtha, pacifies the reactivity of toxins in the body and exfoliates dead skin. 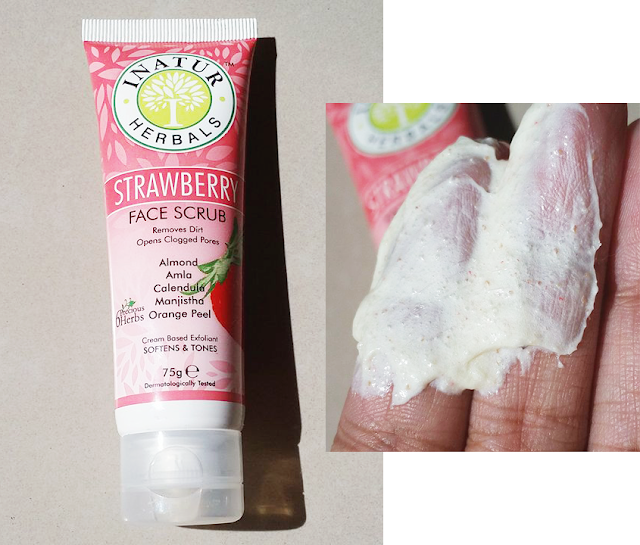 This face scrub perfect for unclogging pores and getting rid of impurities, without irritating skin. It has an interesting texture as it feels more like a cream based face pack. It's soft and smooth consistency makes it easy to apply. 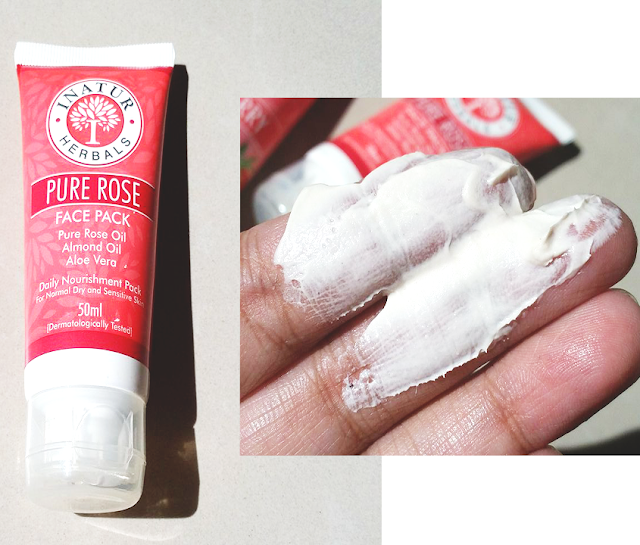 Where other face packs dry out my skin but this one hydrates the skin to ensure optimum moisture level, provides essential nourishment, make the skin fresh and rejuvenated. It is enriched with Pure Rose oil- helps to reduce fine lines and wrinkles, gives softness and radiance to the skin, Sweet Almond oil- is rich in Vitamin E, A, B1, B2, and B6, it effectively balances the moisture level, is easily absorbed by the skin, is softening and nourishing, Vitamin E- rejuvenates and revitalizes the skin by generating new skin cells, thereby making the skin look fresh and healthy, Aloe Vera- helps treat sunburn, delays visible signs of ageing. It's very gentle on my dry skin and I like it so far! Have you tried any Inatur Herbals skincare? They are the best skincare products. You can visit Buy Body Care Products Online to buy body care products at reasonable prices. Best Inatur Herbals range of products. I like the texture of face scrub. Great review.